Taking a leap into the future, the Chinese smartphone manufacturer - Huawei Mobile introduced new P30 flagship devices at an event in Paris. Launched at a starting price of €700 (Rs 54,600), the newest flagship gets triple rear cameras, 32MP selfie camera, In-display fingerprint sensor and Kirin 980 SoC. 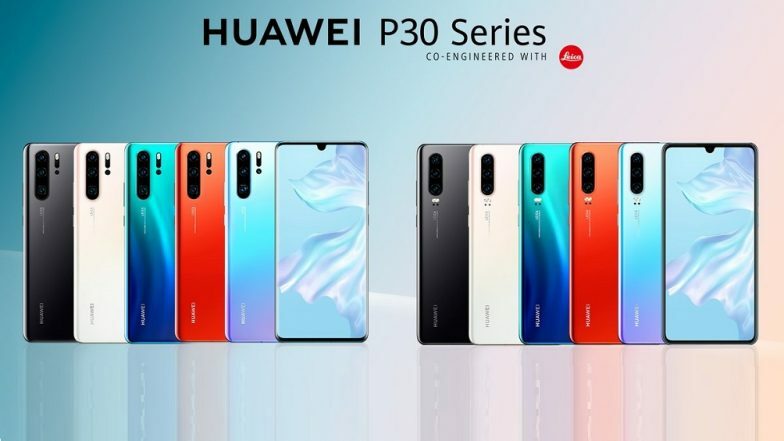 After the launch of P30, Huawei silently listed P30 Lite for some markets. Moreover, the phones are also up for pre-order in Canada. Huawei P30, P30 Pro New Flagship Smartphones With Triple Rear Camera & In-Display Fingerprint Sensor Launched; Prices, Features & Specifications. Huawei P30 Pro: Huawei’s P30 Pro model comes with a 6.47-inch OLED CURVED display featuring resolution of 2340x1080 pixels. The device is offered in 2 versions that varies as per the configuration offered, which includes 8GB + 256GB & 8GB + 512GB. Under the hood, there is a 7nm Kirin 980 Octa-core Processor with Dual NPUs. Huawei P30 Pro also features IP68 certification for water and dust resistance. The phone is backed by 4,200mAh battery with 40W ‘SuperCharge’ support. The P30 Pro is offered in 4 shades - Amber Sunrise, Breathing Crystal, Aurora and Black. For photography, there is a Leica quad cameras at the rear which includes 40MP wide angle lens with f/1.6 aperture, 20MP ultra-wide lens with f/2.2 aperture, 8MP telephoto sensor with f/3.4 aperture and Huawei’s TOF camera. There is a 32MP front camera with f/2.0 aperture for video calling and selfies. The phone runs latest version of Android 9 Pie OS based on EMUI 9.0. Huawei P30 & P30 Pro Flagship Phones Launched At €700 & €999. Huawei P30: On the other hand, Huawei P30 comes with 6.1-inch OLED screen with resolution of 2340X1080 pixels. The P30 model is offered in a single variant – 8GB of RAM and 128GB of internal storage. The phone is powered by the same octa-core chipset that does duty on P30 Pro. Coming to the camera department, Huawei P30 gets a Leica Triple camera including 40MP wide angle lens, 16MP ultra-wide lens and 8MP telephoto camera. The front camera is a 32MP sensor with f/2.0 aperture which is the same as seen on P30 Pro. The phone is fuelled by 3650 mAh battery with Huawei’s Supercharge. The Huawei P30 is offered in 3 shades - Breathing Crystal, Aurora and Black.